Despite criticism that it's a historically inaccurate soap opera, we're still obsessed with Downton Abbey. 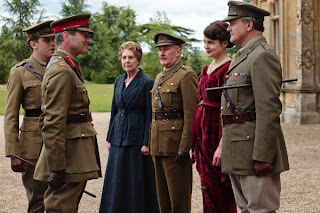 In Episode 2, which aired last Sunday, the Crawleys watched as their beloved Downton was turned into a convalescent hospital for wounded officers. Even their dog Isis was fair game as Isobel—in her newfound pushiness—ordered the family and staff around. Luckily for Isis, the Earl insisted that the dog continue to have the run of the patients' rooms. For us, one of the high points of the second episode had to be Anna running through the house after she found Branson's note to Sybil. It felt like forever as she searched for help to avoid a crisis in the dining room. And what was up with that nasty concoction of Branson's—oil, ink, cow pie and sour milk in the soup tureen! Watch Downton Abbey, Season 2: Episode 3 Preview on PBS. See more from Masterpiece. What is a girl to do? The Giants and 49ers game isn't scheduled to finish before Downtown Abbey is scheduled to start. Such bad timing. I might have to watch DA tomorrow online. Well, it's an easy choice for me, Helene, but I re-watch online during the week too. Whatever you decide, enjoy!